OKLAHOMA CITY, Okla. (BNC) by Jamie Suiter— The Deer Creek church threw a birthday party for one of their members Sunday, Apr. 7, for her 101st birthday. Avanell “Ava” Forrester, was born in 1918 in Wanette, Okla., the daughter of a cotton farmer. Her parents had more children: three sisters (two were twins) and two brothers. Sister Forrester has had an interesting life. She had not been married long when her husband was called for duty in World War II. 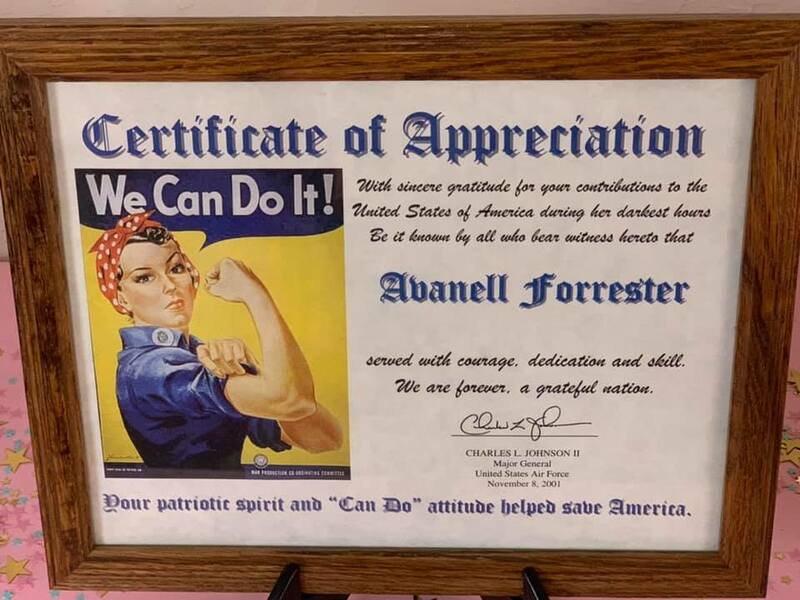 With her husband at war, Avanell was one of the 160,000 “Rosie the Riveter” ladies, employed at the Douglas Airplane factory near Oklahoma City. A certificate of appreciation was given to her for so doing. She worked for a time as a Fuller Brush saleswoman and loves to tell how she sold a comb to a bald man. Avanell also had a furniture store, did volunteer work at the local hospital where she lived and even worked for a pet cemetery. When she was 98, Avanell purchased a new car which she used for a year, until her eyesight became too poor to be able to drive. Her granddaughter, Brandi Binkley, took her shopping recently because she wanted a new dress for her birthday party and a new suit for wearing to worship with the church. She told the women at the dress shop she needed a new dress for her birthday and asked if they could guess her age. They were shocked when she told them, since they guessed she was in her 80s. Walking every day at her three-story assisted-living home and usually leading the group is part of her regular routine along with watching what she eats. Diet and exercise are some of the reasons why she says she has lived so long and so well. According to Brant Stubblefield, preacher with the Deer Creek congregation, Avanell is one of the most faithful and outstanding members of the church at Deer Creek and still well able to attend all the services.